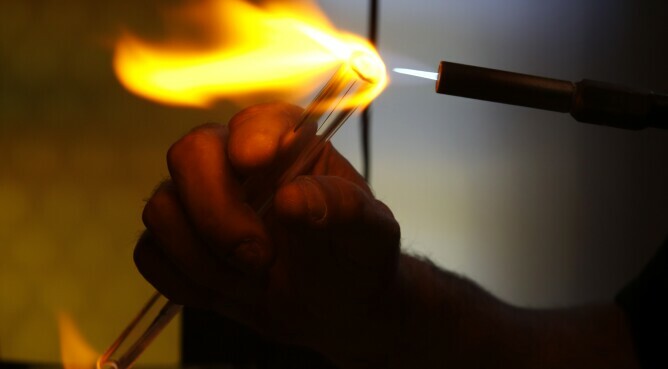 A worker uses a propane torch to polish a glass straw at the EcoGlass Straws manufacturing facility in Hood River, Ore.
From Starbucks to Disney World, San Francisco to the U.K., plastic straws bans are having a moment. In short order, straws have gone from a relatively accepted part of everyday existence to a global symbol of the plastic pollution crisis. Into this mix hundreds of companies are rushing to fill the straw-shaped void with sustainable straw options. There are handmade designer straws, edible straws, bamboo straws, glass straws, and straws made from actual straw. The luxury brand Tiffany & Co. even released a $375 sterling silver bendy straw with gold plating. While plastic straws represent a relatively small part of the 8 million metric tons of plastic entering the ocean every year, environmental activists claim they are also entirely superfluous, which makes them a good symbol for the problems caused by a throwaway culture. One company seeking to cash in on the backlash is the startup FinalStraw, which has developed a collapsible, reusable, stainless-steel straw. Founders Emma Cohen and Miles Pepper set out April 19 to raise $12,000 in funding on Kickstarter. “We were praying to sell 5,000 straws,” Cohen told Bloomberg Environment. As of Sept. 6, the company had raised nearly $1.9 million and had preorders for 150,000 straws at $20 a piece. The company said it expects to begin deliveries in November. In addition to a growing list of companies shunning plastic straws—including Ikea and American Airlines—Cohen said the viral success of social media campaigns such as #StopSucking showed consumers eager to align with the broader trend, even if it means paying for something they used to get for free. While there are no shortage of under-$10 reusable straws to be found at Amazon.com, luxury brands also are making a bid for the high-end shopper. “Luxury doesn’t always mean formality, only limited to special occasions,” said Anisa Kamadoli Costa, chief sustainability officer at Tiffany & Co., whose company is selling the $375 gold vermeil straw. “As plastic waste continues to pose a serious threat to our oceans, we’re proud to offer these enduring and finely crafted precious metal straws as an ocean-friendly alternative for sipping in style,” Kamadoli Costa told Bloomberg Environment. A much bigger problem is discarded fishing gear and nets, which account for the largest amount of plastic in the floating Pacific garbage patch, writes Minter. The issue isn’t straws, it’s what’s done with them, the plastics industry said. “The problem isn’t that straws exist; it’s that they aren’t disposed of properly,” said Scott DeFife, vice president of government affairs for the Plastics Industry Association. But some environmental groups claim the damage caused by straws is greater than their weight by volume. “The fact that you can walk down almost any beach and find them littered all over is a problem,” said George Leonard, chief scientist for Ocean Conservancy, a Washington-based environmental nonprofit. Leonard points out that plastic straws and stirrers pose a particular threat to birds and fish, which can mistake straws and plastic bags for food.